Illustration: Confiscated shark fins were symbolically disposed of at sea in a ceremony witnessed by regional leaders. MAJURO, Marshall Islands (AFP) – (AFP) – The Marshall Islands symbolically disposed of confiscated shark fins at sea Tuesday in a ceremony witnessed by regional leaders attending the Pacific Islands Forum (PIF). The gesture underscored the progress made towards protecting the marine predators since the Marshalls declared a two million square kilometre (770,000 square mile) shark sanctuary in 2011, Angelo Villagomez from the US-based Pew Charitable Trusts said. The fins that were dumped off the capital Majuro were confiscated from a Chinese longline fishing vessel earlier this year that was fined $125,000. Marshall Islands law requires that confiscated fins be burned or dumped at sea, although Villagomez said since the theme of this year’s PIF was reducing climate change “we thought it was better not to burn the fins”. The Pew group estimates more than 70 million sharks are killed annually for their fins, leaving up to a third of open-water species on the brink of extinction. Villagomez said the fins disposed of on Tuesday included ones from oceanic whitetip sharks, which are “protected in every tuna fishery and is the most vulnerable species of shark”. 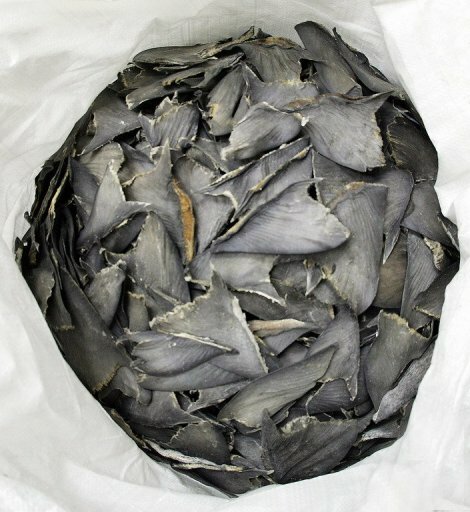 In the north Pacific, the Marshall Islands, Palau, Guam, Northern Marianas and three of the four states of the Federated States of Micronesia ban shark finning. “The Pacific is leading the world in shark protection,” Villagomez said. The PIF officially opens on Tuesday evening with a lavish ceremony on the shores of Majuro’s lagoon.